Visit Longmeadow as it was being developed into a suburb of Springfield in the early 20th century. 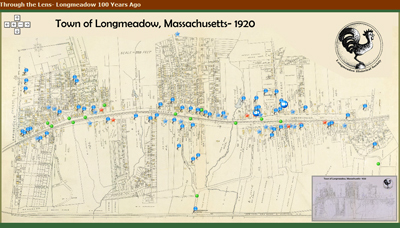 Using the large number of photos taken by Paesiello Emerson from 1900 - 1920 and additional photos that are in our collection + a 1920 map of Longmeadow, the Longmeadow Historical Society has developed a "Interactive Tour of Longmeadow". 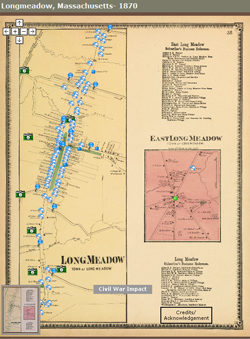 Julianne Kapner, a 2015 Longmeadow High School graduate and 2014/2015 summer intern for the Longmeadow Historical Society created this 1870 interactive map of Longmeadow. Ms. Kapner researched the information using the 1870 United States Census, Longmeadow Town Assessor’s records and other historical archives. In 1870 the town of Longmeadow consisted of East and West Villages prior to 1893 when it was split into the towns of East Longmeadow and Longmeadow. Click here to view the 1870 interactive map. As part of the Digital Commonwealth project our large collection of Emerson glass plate negatives were scanned at high resolution by the Boston Public Library. The large majority of these photos were taken in Longmeadow but some of them were taken in other Massachusetts communities including Spencer, Holyoke, Springfield, Framingham, and East Brookfield. The entire collection of 1500+ Emerson photos are now online on the Digital Commonwealth project website. This Emerson Collection owned by the Longmeadow Historical Society and found on the Digital Commonwealth website is licensed for use under a Creative Commons Attribution Non-Commercial Share Alike License (CC BY-NC-SA). These photos may not be used for commercial purposes without a license from the Longmeadow Historical Society. If you are interested in using any of the photos found on the Digital Commonwealth website or this Longmeadow Historical Society website for commercial purposes, please send a email to LongmeadowHS@gmail.com for information regarding licensing.